The impact of accounts receivable (AR) on business success is unquestionable. Not only is it one of an organization’s largest assets, it deals directly with a different type of asset that doesn’t show up on the balance sheet — customers. So why then, do so many organizations still run their AR processes like it’s the mid-90s? You have to admit, it is a bit ludicrous. Despite its vital importance, AR is consistently one of the most under-resourced and operationally outdated business processes. One recent study found that 50% of all businesses still use manual processes for managing their receivables. Fortunately, as this eBook will explore, the reason for AR’s stasis isn’t an unsolvable problem; on the contrary, the strategies for overcoming these challenges are as simple as they are sensible, and any business can do them. 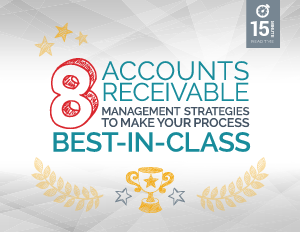 Learn More — Download the Accounts Receivable Management eBook!